College applications seem mysterious. Have you found yourself wondering when your teen needs to start their college applications? Or how to come up with a good college essay topic? Or how to choose the right college? Many students and parents wonder about these questions and more. 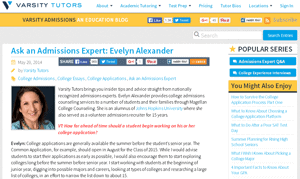 Varsity Tutors Blog interviewed me about my best college admissions advice, so I broke down the key things to remember about college applications in this May 2014 interview. The advice still holds true today. Evelyn: College applications are generally available the summer before the student’s senior year. The Common Application, for example, should open in August for the Class of 2015. While I would advise students to start their applications as early as possible, I would also encourage them to start exploring colleges long before the summer before senior year. I start working with students at the beginning of junior year, digging into possible majors and careers, looking at types of colleges and researching a large list of colleges, in an effort to narrow the list down to about 15.